Hanbury, Droitwich, Worcestershire, WR9 7EA. 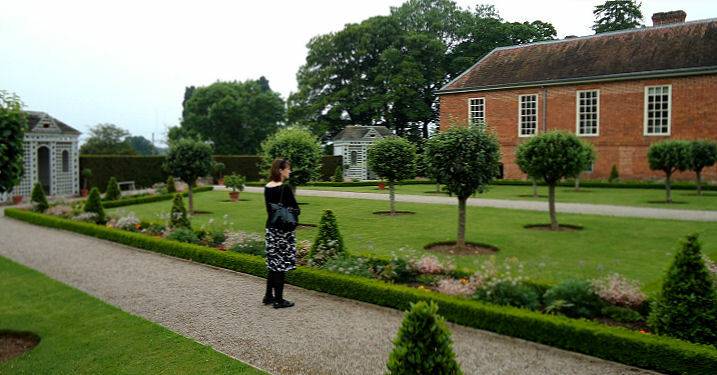 Hanbury Hall is one of those gardens that the National Trust does so well. The estate belonged to a distinguished local family for centuries going into a slow steady decline before being passed on to the Trust at the death of its final owner in the middle of the Twentieth Century. Much study went into the planning of major restoration which is now coming to maturity. 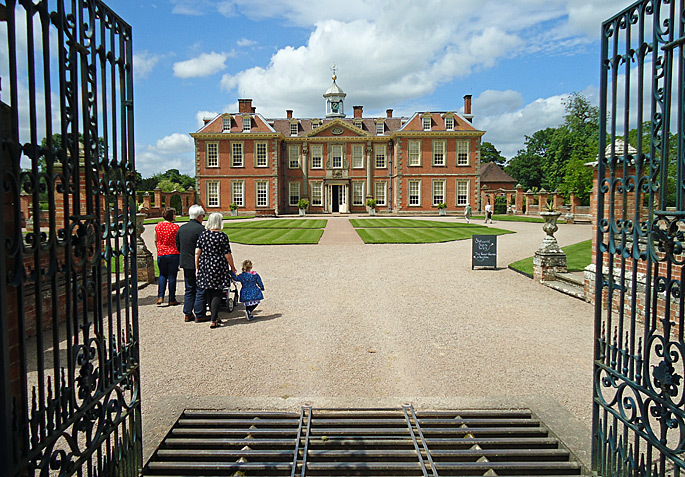 Hanbury was built in 1701 for Thomas Vernon by the architect William Rudhall using the William and Mary style. Thomas Vernon (1654-1721) was a lawyer and Member of Parliament for the City of Worcester and used his considerable fortune to build the Hall and gardens. 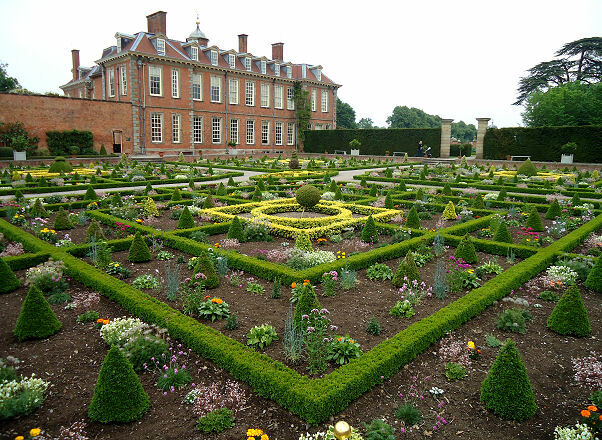 Hanbury remained in the hands of the Vernon family until it was acquired by the National Trust in 1953 under the will of Sir George Vernon, the 2nd and last baronet. Much of the furniture and inside the house did not belong to the Vernon family but have been bought in by the Trust. 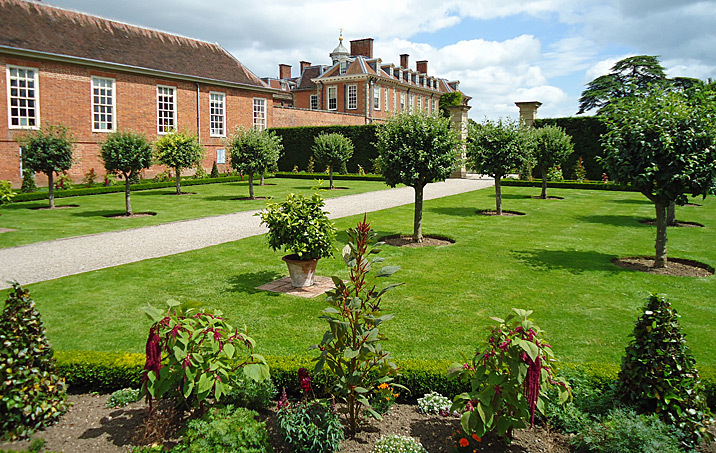 Hanbury Hall is set in 400 acres of of original parkland and garden, however, nothing now remains of the formal Dutch garden which was originally laid out by George London, apart from one long path. 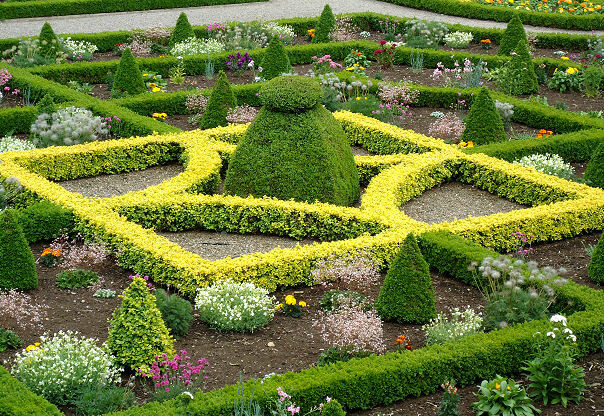 Anything formal was swept away in the Eighteenth Century by Emma Vernon who was following the mania for “landscape” gardens. The original orangery north of the house and the icehouse are still standing, however. 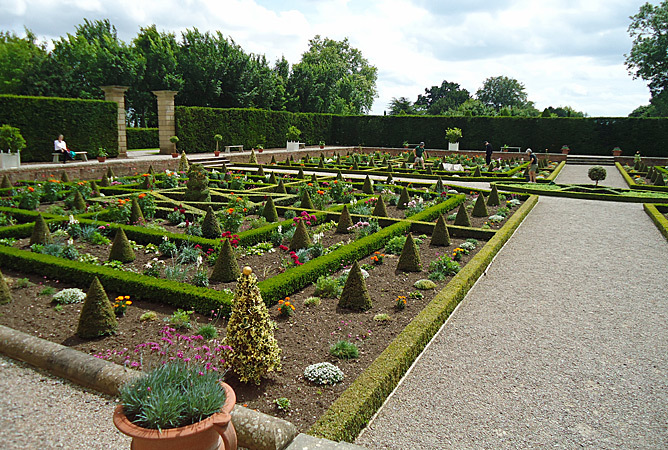 In 1993 the National Trust began to recreate the main elements of the original formal garden. 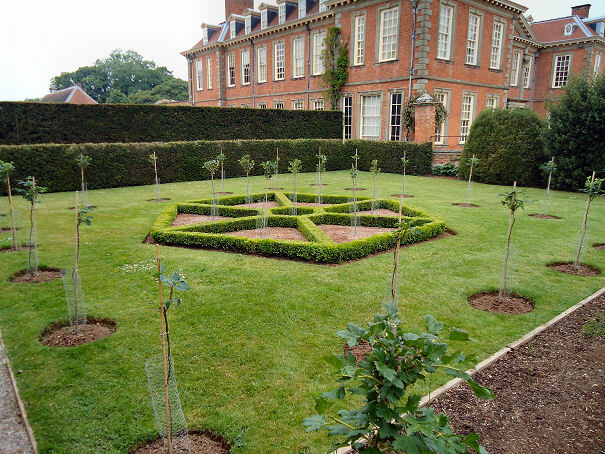 The sunken parterre to one side of the house is now complete with all the box hedging laid out. As can be seen from the photographs this is semi-mature. 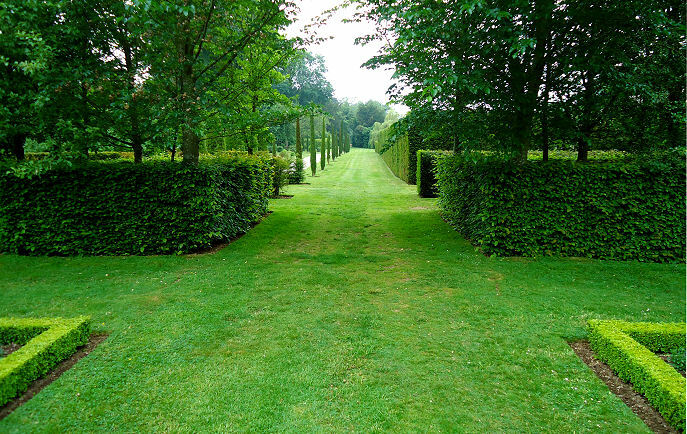 The individual specimens will need a few more years to reach their final shapes but the overall effect of the hedging can clearly be seen. 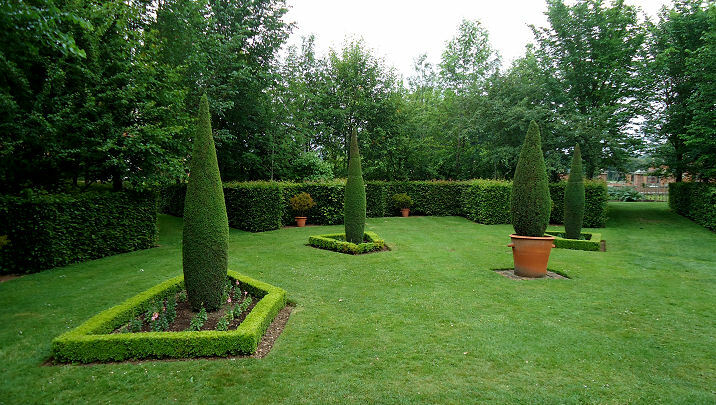 Other areas such as the fruit garden and the formal gardens next to the sunken parterre have been put in in the last year or so complete with two lovely (and expensive) open wooden pavilions.Yew hedging, bay Laurel and other plants are been used extensively in this area and its neighbouring break-out gardens.